Well it's certainly nice to see a bit of better weather over the last few days! Here at High Beech, we are currently refurbishing the shop which includes stripping it all back and then redecorating and putting the new stock in pride of place. This will hopefully be completed by next week so be sure to come down and have a look - it will look very different! We also have a couple of offers coming up from you to help get your season underway. Keep an eye out for next week's newsletter on the first of these! We thought we'd take this opportunity to draw your attention to a fantastic selection of videos well worth watching on our homepage. It's not often you get to speak to the key R&D figures at golf's biggest brands, so be sure to check out these interviews with Foremost TV. Foremost TV was given access to interview equipment brands at the recent PGA Merchandise Show and with your enjoyment of the game our priority, we've put together some fantastic videos that not only showcase the latest equipment ranges - be it drivers, wedges or balls - but give a steer on whether the product will suit you, as well. We all play to different standards and have different goals, one of the reasons why there is so much choice on the market. 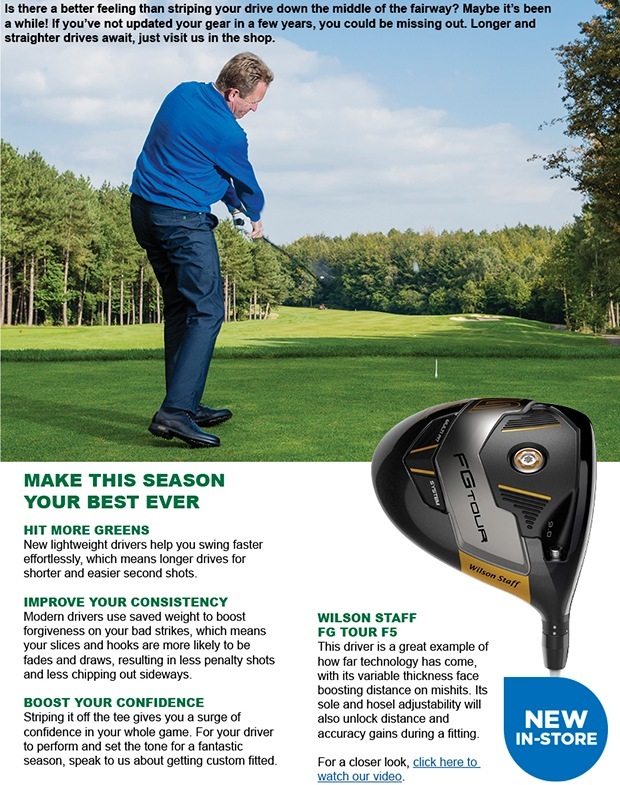 Our store can be a busy place at this time of year with so many new equipment launches taking centre stage, and that can cause confusion for some golfers who are looking to find gear that will help their own game. That's why our advice is always - come and speak to us! In the meantime, you can watch our videos at your leisure. We hope you get a sense of why getting custom fitted is so important if you want to enjoy better golf. Look out for the red play buttons to find out more about the latest equipment, or simply visit my homepage.